Happy 2019 friends! 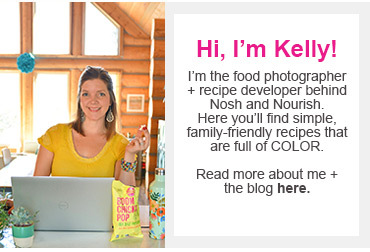 It’s Leigh Ann here from My Diary of Us and I am so excited for a fresh start to the year including new yummy and healthy recipes coming your way! I feel like after the holidays my body just craves fresh ingredients, salads in particular, and I am always looking for new ways to make a satisfying salad that will keep me full and on track with my new year goals! For me, a salad has to have flavor, texture, and a bit of heartiness in order for me not to end up wishing I had eaten a pizza instead. You feel me?!!! I thought so, which is why I am so excited to share this brand new salad recipe with you all! 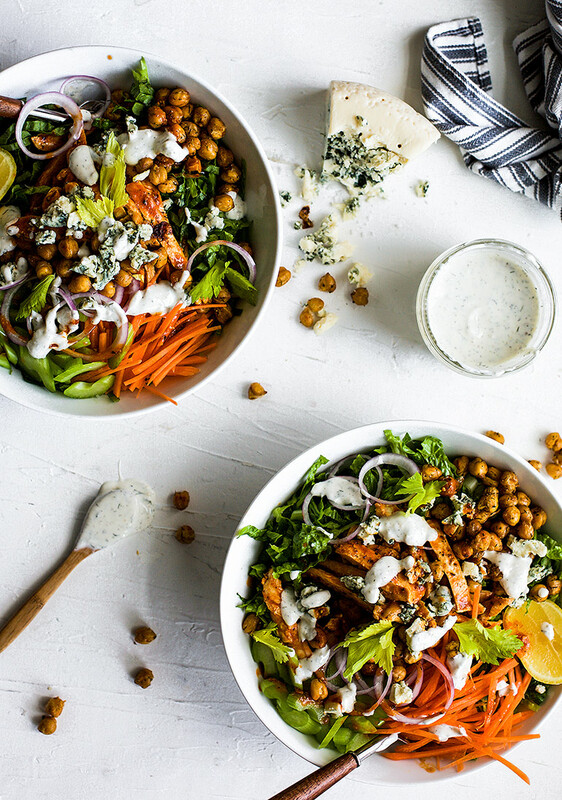 My buffalo chicken salad complete with crispy chickpeas, homemade ranch dressing, and chunky blue cheese crumbles is going to give you all the warm and fuzzy salad feels! I have a confession…I am a wing girl through and through. I love them, like to the point where I can almost eat as many as my hubby, but that being said, I try not to indulge in them that often because some wings can be pretty unhealthy! However, when my cravings hit I have to satisfy them, so that’s where this delicious salad comes into play! It’s everything I love about buffalo wings, but with less guilt and lots and lots of veggies! I can feel good about satisfying this craving and eat it any day of the week I want! 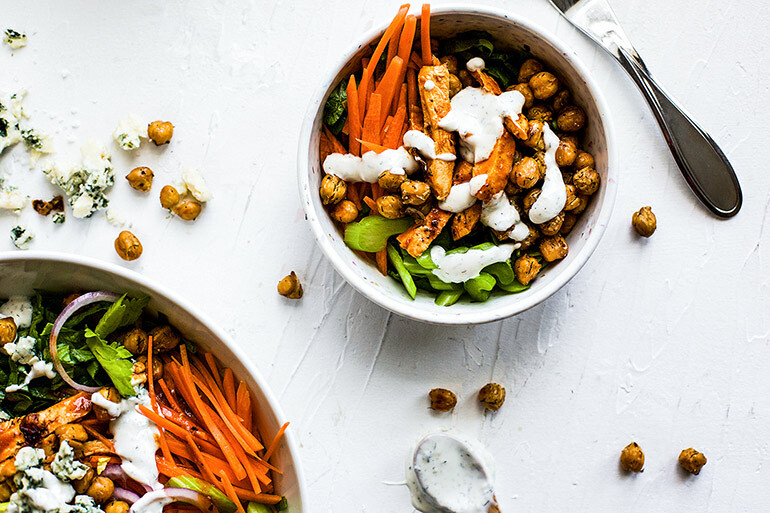 The crispy seasoned chickpeas on top give this salad an extra dose of fiber, protein, texture, and flavor that sets it a part from the other buffalo chicken salads you might have had before! 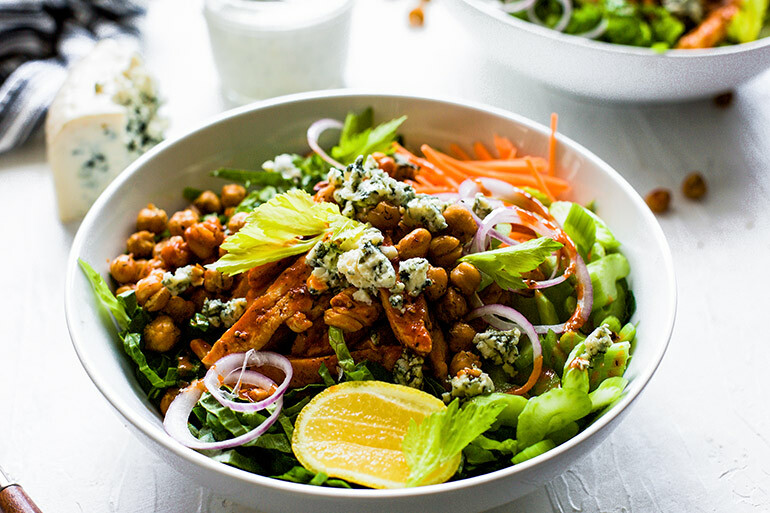 It’s as simple as layering your veggies with thinly sliced chicken that has been coated in a homemade buffalo sauce, sprinkle the salad with some crispy chickpeas, drizzle some homemade healthy ranch, and then add big chunks of yummy blue cheese for the finale hoorah (or sub in goat cheese if you don't love blue cheese)! As Kelly would say, YUMMATOLA! I even got my 3 year old to eat a bowl, I just simply saved a little chicken not coated in buffalo sauce and mixed a pinch of the sauce with homemade ranch so it wouldn’t be too spicy! I love adapting recipes like this so that the whole family can enjoy! This salad is going to rock your socks off guys and gals! I am telling you that this one is good enough to even be served up on game day this year! 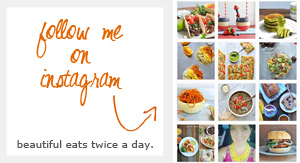 I am so pumped for you to give it a try! You are going to want to save this recipe to make on a weekly dinner rotation! It’s just that good y’all! Toss chickpeas with 1 tbsp. avocado oil, dill, garlic powder, salt, and pepper and coat thoroughly. Place onto a parchment lined baking sheet and bake for 25-30 minutes until chickpeas are slightly crispy. Remove from oven and let cool. Season both sides of the chicken with salt and pepper. If you are using breasts instead of cutlets, go ahead and pound them out until they are about 1/8” thick. Preheat a large skillet to medium high heat, add oil. Add chicken to the pan and sear on both sides for 3-4 minutes if you are using cutlets until the chicken has cooked through and browned on both sides. Turn the heat to low and add hot sauce, butter, and lemon juice to deglaze the pan and scrape up any bits that have formed on the bottom of the pan. Stir until butter has melted and sauce is smooth. Slice chicken into strips and then add back into the sauce and toss to coat. Turn off heat. While the chicken cooks, combine dressing ingredients in a mason jar and shake to combine well. Add more milk if desired for consistency. Chill until ready to use. Layer romaine lettuce, carrots, celery, red onion, and buffalo coated chicken in a bowl. 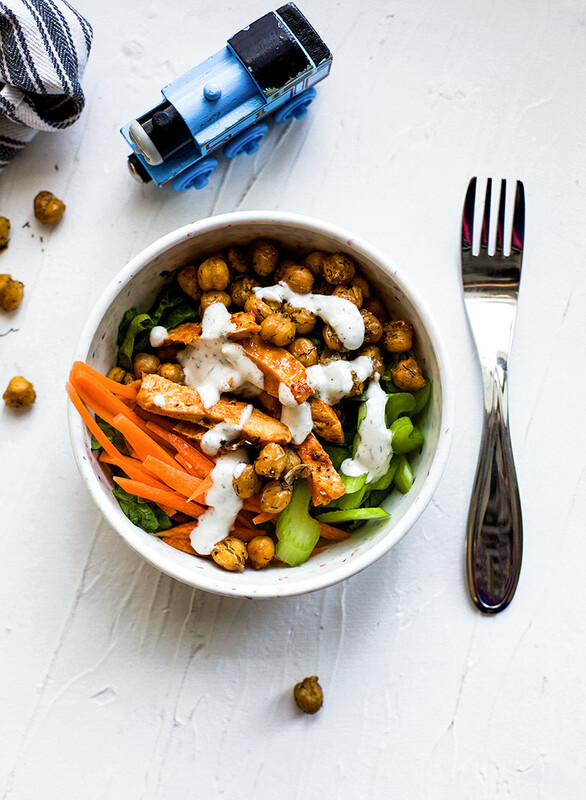 Sprinkle with crispy chickpeas, blue cheese crumbles, and then drizzle with ranch dressing.